Could Oxytocin Be a Social Equalizer? Response: Oxytocin (OT) and arginine vasopressin (AVP) are important neuropeptides known to influence social behaviors in a wide array of mammals. In humans, OT is widely referred to as the ‘prosocial’ hormone and is thought to promote social functions in neurotypical individuals as well as those diagnosed with autism spectrum disorder (ASD). Currently, dozens of ongoing clinical trials in the US are trying to evaluate the therapeutic potential of these neuropeptides in remedying social deficits associated with disorders such as ASD. Yet there are significant gaps in our knowledge especially regarding the neurobiological basis of OT and AVP function. Most importantly, we are unclear which brain areas and pathways these neuropeptides act on to influence social behavior. Additionally, due to strong similarity in molecular structure, OT can bind to AVP receptors with high affinity and vice versa, making it difficult to rule out the possibility that, for example, the behavioral effect of exogenous oxytocin is mediated through the AVP system. Both of these questions have been thoroughly investigated in rodents, but unfortunately the same thing cannot be said for humans. Our study aims to bridge the gap between rodent and human literature on neuropeptide function by studying rhesus macaque monkeys. These monkeys resemble human beings not only in their social behaviors, but also in the neural network that is supporting those behaviors. 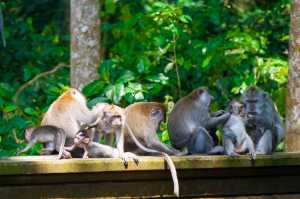 In this study we show that treating one male macaque monkey intranasally with aerosolized OT relaxes his spontaneous social interactions with another monkey. Dr. Marlin: Oxytocin is a hormone that plays an important role in the expression of social and parental behaviors, but little is know about how it works in the brain to produce these behaviors. Virgin mice will usually ignore, and sometimes cannibalize newborn mouse pups. Our study has shown that oxytocin works in the auditory cortex of virgin mice to change both their neural responses, and eventually their behaviors, to mirror the maternal response. Elizabeth A. Lawson, M.D., M.M.Sc. Response: Oxytocin is a hormone produced in the brain that has been shown to reduce food intake in animal studies. The role of oxytocin on appetite and food consumption in humans is not well understood. We therefore performed a randomized, placebo controlled cross-over study of single dose administration of intranasal oxytocin (Syntocinon, Novartis) in healthy men. Subjects presented fasting in the early morning and were randomized to receive 24 IU intranasal oxytocin or placebo. They selected breakfast from a menu and were offered double portions. The caloric content of the food they ate was calculated. They returned for a second visit, which was the same except for this time, they received the other treatment (placebo or oxytocin). There was no difference in how much food the men reported eating in the three days leading up to each of the study visits. On average, the men ate 122 fewer calories and about 9 grams less fat after receiving oxytocin compared to placebo. There was also evidence that oxytocin resulted in greater use of fat as a fuel for the body, and improved insulin sensitivity.